Our little Baby Bird is 1 today. I can’t quite believe it. Papa Bird brought her in to cuddle this morning and I told her the story of her birth… how she was in mommy’s tummy and wanted to come out and see us, so she kicky-kicked a hole in her bath in my tummy and then came out. 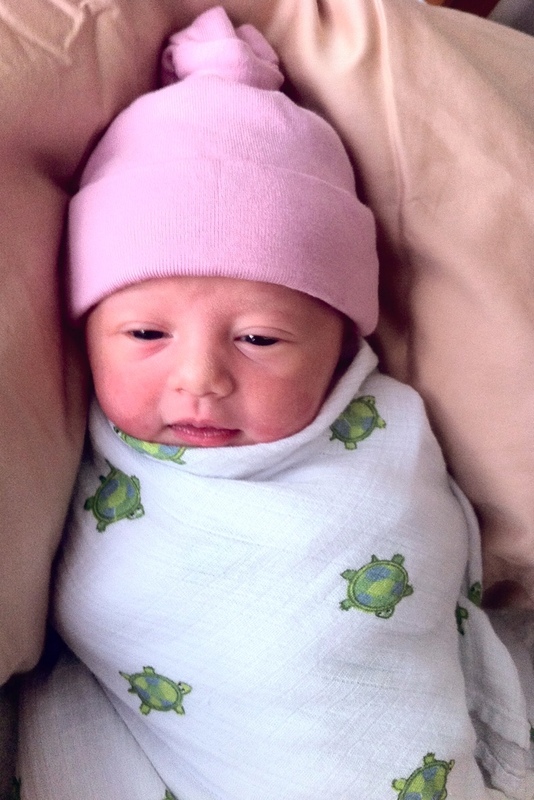 It made me realize that I never got around to writing up her birth story. I thought about it, but I guess having a newborn got in the way. If you are only reading this blog for seasonal recipes, feel free to skip ahead. One day and one year ago… I was settling into maternity leave. All the babies in my family were late (or induced) so I was getting mentally prepared to bide my time. I had stopped officially working a week before, but was still going in to work meetings. I filled up my social calendar with lunch dates and figured I would rather cancel a lunch date than sit around the house waiting. I went shopping for the first time and bought her a little outfit. I wasn’t interested in having the doctor induce me early, but once I was full term and everything looked healthy, I was all for natural remedies for inducing labor. Walking, spicy food, eggplant, basil, evening primrose oil… basically everything but castor oil (which I don’t recommend.) I had been drinking Red Raspberry Tea (Iced) for most of the third trimester. I went to regular Acupuncture throughout the pregnancy. He was treating my common pregnancy symptoms and using Chinese “Pretty Baby” points. With my OB’s okay, he had started doing points to help induce labor and sent me home with a stick of moxa. If you are looking for a natural remedy to induce labor, my husband and I are convinced it was moxabustion that did it! The night before Baby was born, my husband held a lit stick of moxa up to certain points on my lower back, lower stomach and feet. Little baby was a kicker, but right after the moxa, she started kicking like never before. It didn’t feel like anything was wrong, just like she was especially active and happy and excited. Pregnancy insomnia and I were old friends, so around 3 am on the 17th I went into the nursery to read. I went back to bed at 5 am and before I fell asleep, I felt my water break! I knew that “was it.” Still, I decided to let my husband sleep a little longer and started packing last-minute items for our bags. There was some laundry to put away (the new “coming home” outfit I had bought–that didn’t fit her until she was 4 months old) and several pounds of heirloom tomatoes from the garden to process and freeze. Around 6 am I woke up my husband, and calmly told him not to worry but it was time to go to the hospital. “No rush, but let’s get ready.” I washed my hair (which if you know me is actually an event) and he watered the garden and told our neighbors to look after the chickens. Then I started feeling nauseous and told him to rush. Around 8 am we checked in to Sharp Mary Birch Hospital. We were so lucky to have a hospital devoted entirely to women and newborns. I was also a Sharp employee at the time and somehow got flagged as a VIP. (We ended up getting a great private recovery room in a quiet corner.) Since the 18th was my father’s birthday, my husband was hoping the labor and delivery would take all night so baby would have his birthday. (I was NOT wishing it would take all night.) I was only half an inch dilated, so they started me on Pitocin. My little sister came by around lunch time to bring my husband food and visit. She ended up staying through the delivery. Many of my friends have tried for natural child births. My mother delivered all three of us medication free. While I admire that, I was a realist that I don’t have great pain tolerance. I also have known a lot of people who had a lot of expectations in their birth plan, and nearly all were disappointed. I know that many do have completely natural child births, but lately, it seemed that all of my friends who tried for it ended up with C-Sections! So my philosophy was to go with the flow, request the least amount of intervention necessary, and trust in the medical team I selected. I think our birth “wish list” had only 4 items on it… including to have the least amount of interventions and that one of us was always with baby. I was, however, rigid on breastfeeding. I didn’t want any formula or pacifiers introduced and I wanted to be able to breastfeed her right away. The hospital, fortunately, was already on board with that, and did all of that anyway. In any case, I hadn’t ruled out getting an epidural. After the contractions started getting quite intense, I asked them to check my dilation. I figured that if I was close, like a 7 or 8, I would skip the epidural. Turns out I was only at 3 cm, so I opted for it. Getting the epidural was actually the worst part of the whole experience. It made me feel shaky and throw up. But then I felt relaxed and took a little nap. Thankfully it was not so strong that I was numb, but it lessened the severity of the contractions so that they felt more like the Braxton-Hicks “false” contractions I was used to. I was also able to feel when to push. Around 6 pm they told me to start pushing. It took about 2 hours. It was definitely work. Good thing I stayed active with exercise during the pregnancy. My husband was great throughout the whole experience but I did snap at him once when I thought he was playing Words with Friends between pushes. Halfway through it the doctor and nurse assigned to me switched, but it really didn’t matter. The new OB was female. She thought it was great that Baby had so much hair and gave her a mohawk as she was crowning. At 7:56 pm on September 17, 2011 our Baby Bird was born. 18 inches long and 6 pounds 14 onces. It hardly seems possible but we love her more and more each day. This entry was posted in Family Adventures, Our Family, Parenting, Pregnancy. Bookmark the permalink. birth stories make me cry, and bring back (mostly) good memories of my own. Thanks for sharing! I found your blog through the SD BW group. My best friend delivered her baby boy on 9/17 last year Mary Birch. 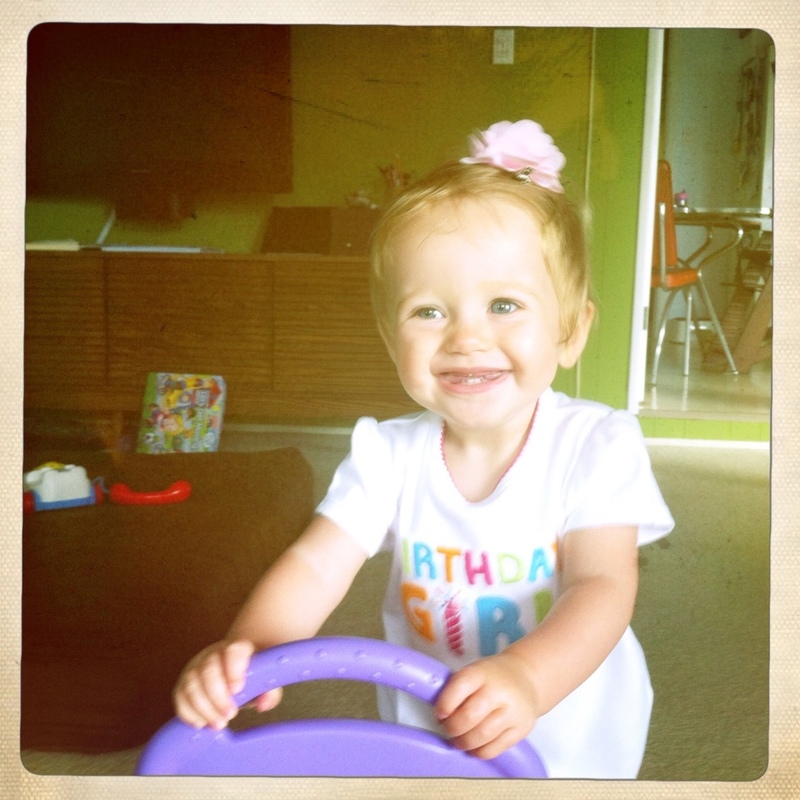 Happy 1st birthday to your little one, and happy birthing day to you! So beautiful! Thanks for sharing! She is so amazing! She is so blessed to have the two of you as her ever so loving parents! What a beautiful infant she was and a beautiful baby girl she still is! Thanks Charlotte! Has Cora predicted the gender of her baby sibling?